Settle down for a cup of tea or coffee and a slice of cake, a bowl of handmade soup or a sandwich in the Tea Room and Gift Shop, situated in the original dining room of Murrayton House. Browse our adoptions booklet where you can find out more about all of the monkeys you have seen around the Sanctuary. 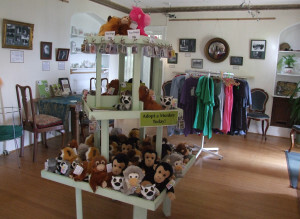 Take a look at the selection of ethically sourced giftware, clothing and toys available. Everything within the shop has been sourced from companies that operate with an ethical, Fairtrade, organic, recycled or other ethical means of production. The tea room and gift shop are open during normal Sanctuary opening hours; however, you can shop with Wild Futures at any time via the online shop.